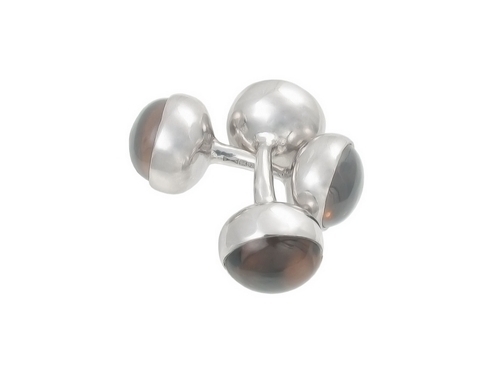 All cufflinks should have something on both sides of the link. They always did and it is pure cheapness not to today. The inside is seen almost as much as the outside, and a cheap steel bar is not decoration. Cufflinks that have decoration on both sides are normally some form of insignia or stone, joined with a bar or more commonly a chain. This is difficult to get through the cuff but, more importantly, it is also much longer than, say, a silk knot. Silk knots are increasingly worn because they are cheap, readily available and a nice way to add a touch of colour. But they grip the cuff tightly, and as I wrote about in my series on bespoke shirts at Turnbull & Asser, the difference in cuff size between one joined with a silk knot and one with a chain link is up to 5/8 of an inch. For anyone that has bespoke shirts made, that’s a lot. It undermines having cuffs made to fit. The added problem is that loose links sit further outside the cuff and ‘clink’ on the desk as you type. This can never be entirely removed (and is less of a problem if you wear a jacket) but is considerably more irritating when the link is loose. Finally, the decorations leave a lot to be desired. Why a man would wear humorous cuff links is beyond me; brand logos are little better; crests are fine but not exactly exciting. Some brands do nice models in lapis lazuli or mother of pearl (Links of London is one example), but they fall down on points 2 and 3. 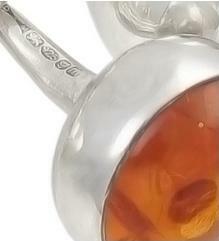 Because these stones are so common on the market, we deliberately avoided them in our links. The first thing was the link that joins the two sides. We fashioned several options out of silver wire, trying out each until we found the perfect length – not too short, but gripping both sides of the cuff effectively and sitting neatly in them. We also experimented with the curvature, before designing two styles – one round in cross-section, one square, both gently tapered. We wanted the stones on each side to be identical. But they had to be as big as possible while remaining easy to punch through the cuff. After several iterations, we settled on 10mm, with most of the stones being spherical. Finally, the stones themselves. Most would be for daywear, so they had to be plain, probably matte and with most interest in the texture. 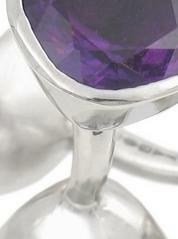 One pair would be for evening, which would again be a dark stone but faceted to give it sparkle. Pearls are perfect. Whether white or grey, they are simple and sophisticated, looking particularly good on white shirts. I’ve always loved amber, so we added that, making sure it was dark and messy enough to give some textural interest. Labradorite is a great, dark stone with a shimmer in the sliced section you can see only at certain angles. Smoky quartz for a dark option (these will be in limited supply) and amethyst for evening. At this point it should be said that these cufflinks are all going to be made to order, made by Diana and sold through her website. I stand to make no money from them. I just wanted to design what I thought the perfect cufflink. The links that connect the two sides have been moulded and will be individually cast. The stones are each then set individually by hand, as you would do with bespoke jewellery – the silver is shaped by hand around the stone. 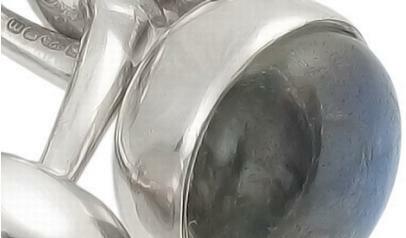 They are then polished and finished by hand also. As they are made to order, you can select different stone combinations. 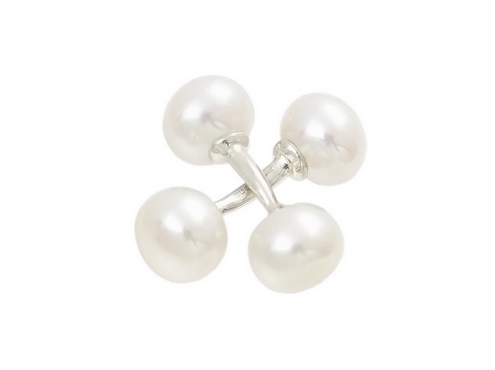 But the settings have to remain the same, so pearls with pearls, round settings (cabochons) with round settings. I will wear identical pairs. These are individually designed and made that look better and perform better than anything else on the market in our opinion. We hope you like them. Orders can be placed through the Shop. – The pearls are cultured freshwater pearls, in white, grey and peacock. – The labradorite is available in two hues, green and blue. – The smoky quartz is made with one end faceted underneath, creating a very subtle texture. These are limited to four pairs. 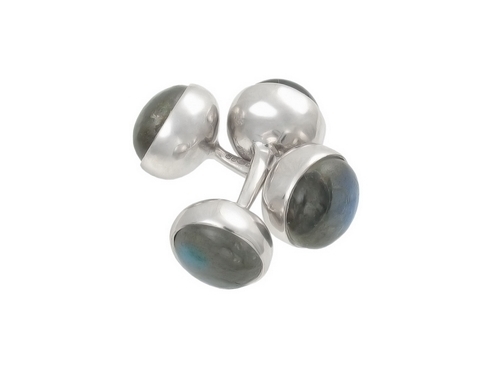 – All other stones are limited to 100 pairs of cufflinks. Each comes with a numbered valuation. 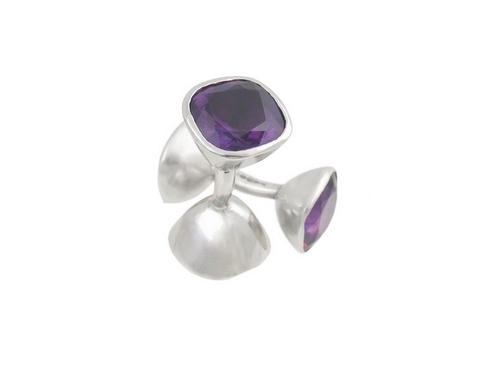 – The silver stems are all circular in cross-section except the amethyst, which is square. 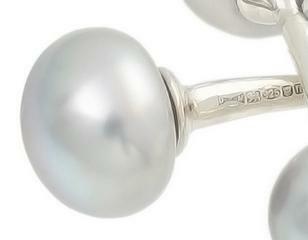 – The silver is all hallmarked at London assay office. It’s tiny! – Postage is included in the price and turnaround time for an ordered pair is 4 weeks. Allow 2 weeks for postage to the US due to current Homeland Security restrictions. Express delivery to the US is available for £48 through DHL. This takes 2-4 days. – Click on the images to get bigger versions. You can follow the discussion on The cufflink project by entering your email address in the box below. You will then receive an email every time a new comment is added. These will also contain a link to a page where you can stop the alerts, and remove all of your related data from the site. Have a look at cuff links by Jean Schlumberger designed in the 50’s and 60’s I think he beat you to it.Mind you your prices are a steal by comparison. I can only agree with your comments on the excessive lengths of many cuff-links, which spoil the effect of French cuffs. In older apparel there seemed to be also single cuffs held with links and I wondered if it was possible to get these and remodel them for today. I make a lot of my own using old sterling silver buttons. I like your links, but to be honest they’re just too expensive for me, though I understand the effort that has gone into them. Lovely links. A bit rich for my blood, but just right aesthetically. 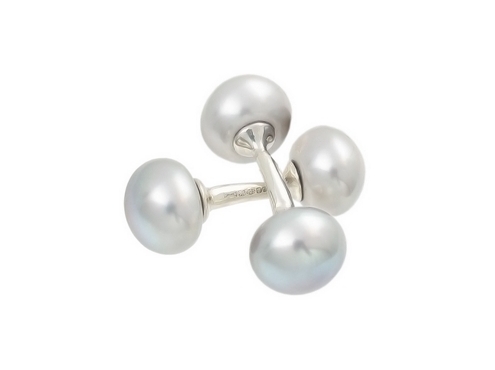 I won’t be be purchasing these as my cufflink collection is more than adequate–although they certainly special. Nonetheless, I HIGHLY encourage you to co-create more offerings that can be purchased via your blog. Why? I trust your taste, believe you would only work with craftsmen of the highest quality and know you to be thoughtful about style. I therefore encourage you to partner with more craftsmen to co-develop other items. I suppose that I inviting you to monetize my trust in you and desire to be well dressed. 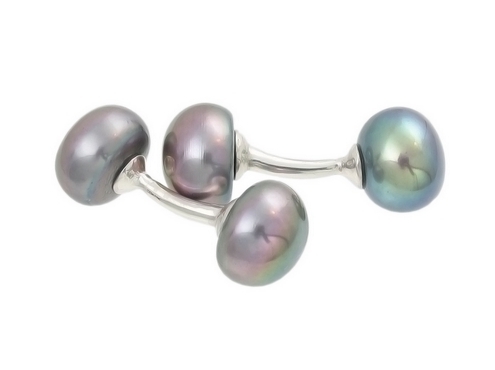 love the post and the cufflinks, but I disagree with you on the T-bar cufflinks. While I prefer double sided, my large collection of antique and vintage links, collected from inheritance and antique stores, feature many t-bar cufflinks, including the gold filled, the pearl, and the sterling silver. In addition, I find that some settings could never work as double sided, as they are far to large to fit through the small holes, or the settings, like the beautiful set Sodallte stones I picked up at the National History Museum (an absolutely amazing museum. We Americans, or at least me, are secretly jealous of it), would be far too small. I wonder if the T-bars established themselves on my side of the pond before it dead on yours. Hi Simon, you mention that the bar in most cufflinks is too long. May I ask, what is the length of the bar in these cuff links? Thanks Simon, that is much shorter than usual isn’t it? Most are about twice that! Interesting. I have 2 questions – 1. I’m thinking of having my suit-wearing shirts made with a single link cuff instead of the standard double cuff. Would the shorter stem on these links work for a cuff of this type, where there’s less fabric to grab in between the two ends? 2. If I chose to buy these, would I need to go directly to Diana Maynard since I don’t see them on the shop? 1. Well, they’re designed for a double cuff, but would still be better than the vast majority of links out there for a single cuff, as others tend to be wider. 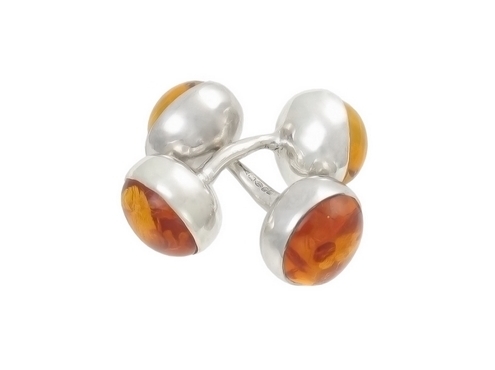 I like look of the amber cufflinks, but I don’t have much by way of orange ties.